(Reuters) - Bianca Andreescu has brushed aside several big-name players during her meteoric rise in women's tennis, but the Canadian teenager is wary for now of injuries, and not opponents, becoming the biggest obstacle in her career. 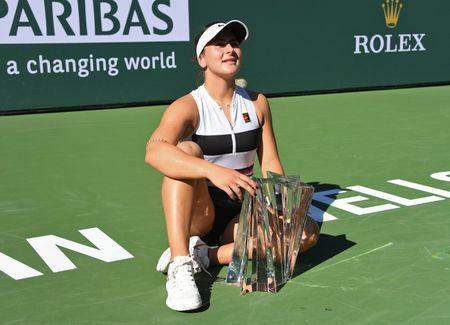 Andreescu, who has dealt with several injury setbacks in her young career, needed to overcome nerves, fatigue and arm and leg issues during her triumph over former world number one Angelique Kerber in Sunday's Indian Wells final. "I've never been in a situation like that before. Never been in a final of a premier event playing a very high-level opponent," Andreescu said on Tuesday during a conference call from Florida where she is competing in the Miami Open. "So I think it was also all of the emotions and all of the tension that was going through my body that caused me to get even more tired than I usually would." A struggling Andreescu called for her coach after falling behind 3-2 in the decisive third set of her win over three-times Grand Slam champion Kerber and said her "feet were burning" and that she was having trouble moving on the court. "Tennis Canada has a great group of doctors and I've been running some tests with them to see what the problem is," said Andreescu. "But definitely after Miami I will take a good two or three weeks off just figuring out what to do better with my body and my nutrition and my mind." Still, the whirlwind start to the year, a period in which Andreescu has shot to 24th in the world rankings from 152nd, has given the Canadian a sense of confidence when competing against the world's best players. "Now that I am gaining more and more experience and getting more and more confident playing against these top-level players I am definitely not starstruck anymore," said Andreescu, whose run in Indian Wells included wins over five seeded players. "But I want to just go into every match not trying to focus on who's on the other side (of the net) and just focus on myself."